This text covers course material for nursing students, primarily those in BSN programmes. Core topics include leadership and management styles, organizational theories and structures, budgeting, resource allocation, staffing and scheduling, ethical considerations in nursing research, variables, hypotheses, research designs, sampling techniques, and data collection and analysis. 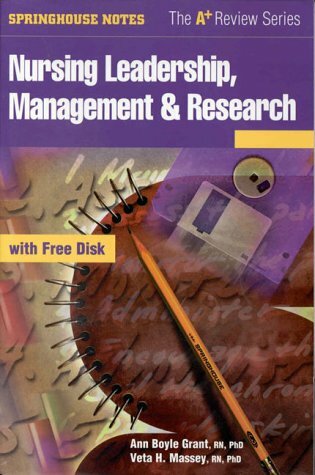 The accompanying Windows-compatible Study-Smart disk includes 200 multiple-choice study questions to enhance the student's performance in exams. GRANT, ANN BOYLE; MASSEY, VETA H.